I wasn't sure if I was going to post the Christmas decorations that made me go "huh? ", but anyway, check them out and have your say haha. Good, *loll* because this is most likely my last post before Christmas, so I just want to wish you all a very MERRY CHRISTMAS and may your holidays be like Santa - fat, cheerful and abundant! Preparing for hibernation this week... over and out! When we walked into the shopping mall two weeks ago, I loved what I saw and just couldn't take my eyes off – no, not the Christmas cabin, nor Santa's reindeer – but the fairy lights! Must admit that I'm quite impressed with the Christmas decorations this year. #4 Fairy lights (twinkly lights, Christmas lights or whatever you want to call them) are really beautiful, don't you think? This makes me want to cover my bedroom in twinkly-fairy-Christmas lights and pretend I'm a princess loll. So much Christmas cheer going around and beautiful decor to see! However, we couldn't spend our sweet time taking pictures because our friends were waiting for us at Bavarian Bierhaus (blogged about our first visit *here*). Oh, by the way, have you seen 1 Utama's Christmas decor? O.M.G. 'Tis the season to shop and after a full "Round One" of shopping, we needed to rest our weary feet and also a caffeine-pick me up, before "Round Two". Stopped off at La Bodega, but there were no vacant seats outside. So we went to Cafe de Paris (right opposite La Bodega), a contemporary French cafe-bar with classic yet modern interior. Sat at the al fresco area and the place is great for people watching, too! After sitting down and placing drinks order, our server asked if we wanted to try some French pastries. We were both still very full from lunch that we had to decline. I um, I can't stop thinking about macarons and chocolate eclairs now! Opted for an Iced Latte (RM12++) and realized what a find. Rich, creamy and it was oh-so-delicious! Since I don't like black coffee, I didn't try the 007 (RM12++). Not sure why they name it 007 but oh, in the novel Live and Let Die, James Bond, Agent 007's favorite coffee is a Blue Mountain brew from Jamaica. We sipped our nice, cold drinks as we reminisced back to what seems like errr... just yesterday, but reality is that it was lifetimes ago haha! We then popped back to the mall and the rest of the afternoon was spent shopping, taking some pictures, resting a bit and oh y'know, having another drink somewhere else. I need new feet! 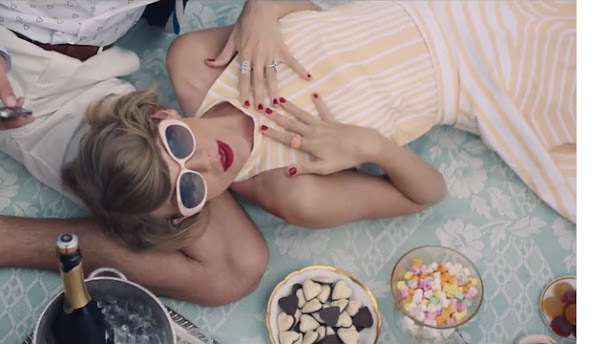 Have you listened to 1989, Taylor Swift's latest (pop) album? I actually rarely listen to her music, but I absolutely love her sense of style. It's very chic and she looks great in anything. She's gorgeous, obviously, and can't deny that the girl knows how to make hits! 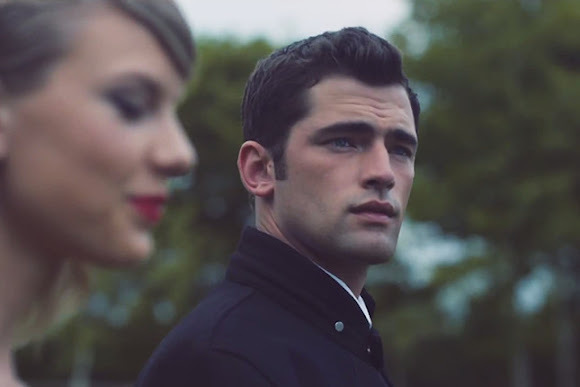 When my friend Aida showed me the music video for Blank Space, I couldn't stop watching and hitting 'repeat'. Not only is the pop track so much more than its catchy as hell chorus (you've been warned), but the wardrobe in the video is to die for. Also, I love her ability to mock perceptions of herself haha. "Oh my god look at that face, you look like my next mistake." Yeah, yeah Sean O'Pry (highest-paid male model worldwide in 2013) is incredible HOT. Aida said: "His eyebrows are just so yummy!" O_O Hahaha. "Grab your passport and my hand, I could make the bad guys good for a weekend." "You know I love the players, and you love the game." "Darling, I'm a nightmare dressed like a daydream." Would you LOOK at that dress!? Whoaaa... the Christmas decorations at Pavilion KL this year is truly magnificent and absolutely stunning! If someone asks me when should retailers start displaying Christmas decorations, I would say, "Anytime is good with me!" Haha. As expected, the mall was jam packed full of people last Saturday. Hence, I didn't take many pictures and no matter where we stood, it seemed like we were in somebody's camera shot loll. With music playing in the background, I can't help, but hum along and there's nothing better to get me in the festive mood than the Christmas songs. #18 You better watch out, you better not cry, you better not pout, I'm telling you why, Santa Claus is coming to town!